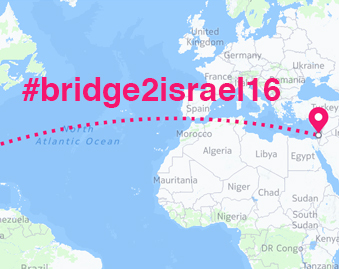 I was privileged to join the A Wider Bridge 2016 LGBTQ Leadership Mission to Israel on November 10, 2016. 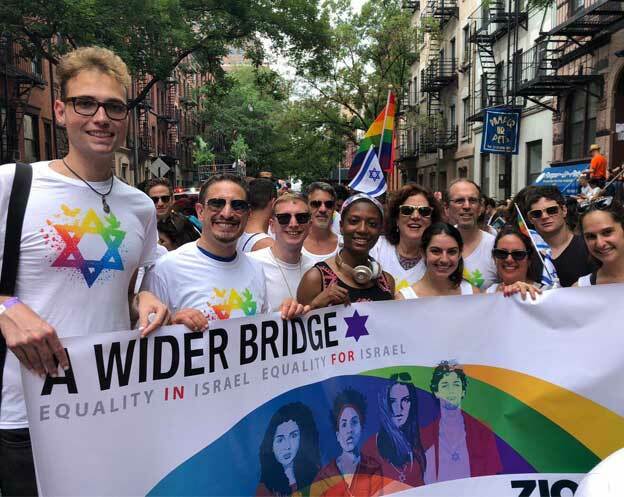 A Wider Bridge, of which I am now a member of the Board of Directors, connects the Jewish LGBTQ communities in North America with LGBTQ communities in Israel. I was particularly interested in participating in this trip because the participants were leaders in various LGBTQ and civil rights organizations in North America. The participants ranged from journalists for LGBTQ publications, to ACLU professionals, to political staffers and community leaders. The participants were from all parts of the United States – from Seattle to Minneapolis to Chicago to New York and D.C. and Florida. A majority of the participants were non-Jewish and first timers to Israel. Having been to Israel numerous times, I was fascinated to experience Israel for the first time through the eyes of non-Jews and first-timers to Israel. The trip was, in a word, extraordinary. Here are my highlights from the trip. The trip started in Jerusalem with a dinner presentation on November 10 by Yiscah Smith, a trans educator and author of “Forty Years in the Wilderness: My Journey to Authentic Living”. She lectures widely in Israel and the U.S. on trans issues and presented us with a version of her TED Talk. At Shabbat dinner the next night, we heard from Sarah Weil who leads an initiative called “Meeting Place” which is on the frontlines of LGBTQ activism in Jerusalem and engages some of the worst homophobia head on through radical empathy and compassion and whose dedicated activists are committed to opening hearts and minds, one person at a time, through face to face encounters and dialogue every Thursday night at Zion Square in Jerusalem. Shabbat was spent on the West Bank visiting Bethelem, the new city of Rawabi and Ramallah. In Bethelehem, we met with representatives of Wings of Hope, an NGO providing psychological support for a wide range of counseling services for people of all ages who suffer from post-traumatic stress syndrome and other psychological problems. They counsel over 1,000 people at their Center with a staff of 8. They provide individual, group and couples and family counseling, including over 600 children. Most of their donations come from Germany and they can always use more funds to provide more and better services. Their staff is trained in Ramallah on how to address LGBT issues in Bethlehem society. We also visited the separation wall from the Palestinian side in Bethlehem. The graffiti on the wall tells its own story of how the Palestinian people view the Israeli occupation and the separation wall. Our visit to Rawabi was fascinating because it is an ultra-modern, planned city for Palestinians. While it currently has about 2500 residents, eventually it may house up to 40,000 people. We ended our visit to the West Bank with a meeting with another NGO, Zimam, a movement of moderates dedicated to fighting extremism, non-violently challenging the Israeli occupation, and building a sovereign and democratic Palestinian state. I asked the Ziman presenters if they have any contact with the settler movement. I was told, in no uncertain terms, that they do not. I have participated in other tours and programs on the West Bank (a trip to Hebron with Green Olive Tours and an Encounter trip to Bethlehem ) to meet with Palestinians, but visiting with these two organizations and seeing Rawabi was a very different and enlightening experience. On Monday morning, we met with three members of the Knesset. Amir Ohana is a member of Likud, openly gay, married and a father. He spoke of what it is like being gay and a member of a right-wing party in Israel and spoke about human rights and immigration issues and his support for LBGT rights. On the immigration issue, he pointed out that asylum seekers come to Israel for two reasons – a better life (economic) or as refugees (fleeing repression). Those seeking a better life are turned back. Michal Rozin, a member of the Meretz party (which had a poor showing in the last election) is a strong advocate for LGBT rights and, as a member of the Opposition, opposes many Likud government policies. The third speaker was Sharren Haskell, a young member of Likud who also professed strong support for LGBT rights and spoke at length about environmental issues. She stressed that she wants clean air, water and food while at the same promoting industry self-regulation on environmental issues. All of the speakers addressed the issue of two states with differing views on whether there will be one or two states and whether Israel will use eminent domain or annexation to incorporate parts of the West Bank in Israel proper. None offered a solution, realistic or otherwise, to the Israeli-Palestinian conflict. We visited Nazareth later Monday and were treated to an extraordinary experience at the Polyphony Conservatory (www.polyphonyfoundation.org) which brings together Israeli and Arab children and young adults to create music. The conservatory builds bridges between Arabs and Jews through the common language of music and we were treated to a performance by five of the students in the school’s program. Through their residential and visiting music programs, they reach 8,000 children in Israel annually and their student orchestra has traveled throughout the world. The Jewish and Arab students study the same curriculum and their role models are graduates of the conservatory program. Some of their graduates have gone on to professional careers in music. The Israeli government provides funds for teacher training and there are currently 170 Jewish and Arab teachers learning the music curriculum to apply in their local schools. World renowned musicians teach master classes at the Conservatory and Renee Fleming, the world famous opera singer, hosts a video that promotes the school (and there are several you tube videos of the students at the conservatory). The conservatory is truly inspirational and was yet another example of what we experienced where Jews and Arabs work together to create a peaceful and respectful society. We made our way to the wonderful Pastoral Hotel in the kibbutz Kfar Blum (I was in the Whoppi Goldberg room – the Building 6 rooms are all named after movie stars, the Building 5 rooms after composers, etc.) and after dinner we had a group debriefing session on what we had experience so far on the trip. The next day we did a jeep tour near the Lebanese border overlooking the Hula Valley, visited the Adir Winery (great goat chesse and spectacular wine), spent lunchtime in Safed and then visited an Ethiopian Absorption Center where we learned about the challenges of integrating Ethiopians who came from rural farming communities in Ethiopia who spoke no Hebrew into a multi-cultural Hebrew speaking society. 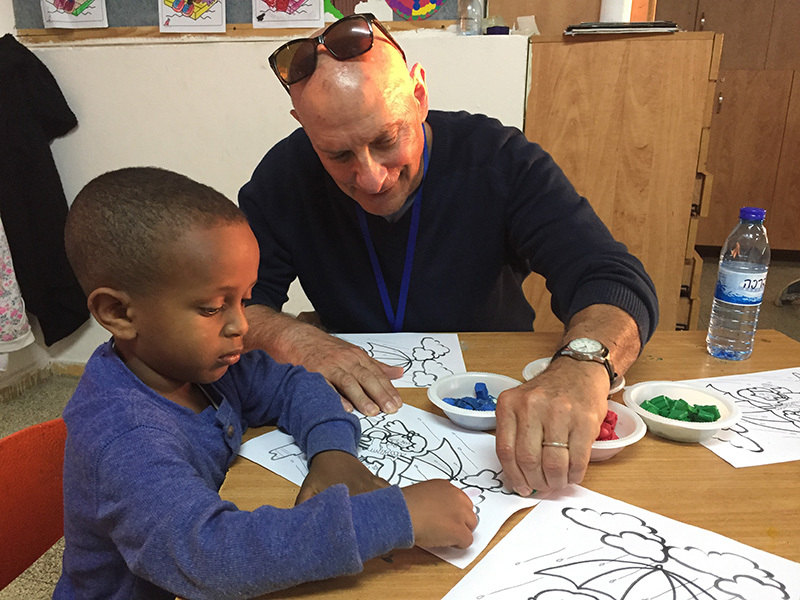 We were treated to a home visit where the woman of the house made a special Ethiopian bread for us and we visited a kindergarten class where we colored with the kids and played a game of musical chairs (I came in second!). That night we had a presentation from an LGBT group from Afula, a city of about 50,000 people where the LGBT community has created its own social organization on what they call the “periphery” of Israel gay life (meaning not Tel Aviv and not Jerusalem). They could easily live in Tel Aviv or Jerusalem but they march to their own drummer and create their own events for their communities. It was fascinating to learn about LGBT life in the Israeli periphery (much, I imagine, like LGBT life in small cities in the South and Midwest US). There was a big party planned for the night after we left Kfar Blum that we were all invited to. However, we were heading the next day to Tel Aviv via Haifa and Jisr-al-Zarqa on the Mediterranean. Our stop in Haifa included, of course, the famous Baha’i Temple Gardens but the most interesting visit was to the Haifa LGBT center where the folks we met with were very excited that they were about to move into their own facility and create their own LGBT center. Haifa, in additional to being Israel’s most beautiful city, is the most “integrated” Israeli city with large Jewish and Arab populations and lots of programs that bring together Jews and Arabs to pursue common interests. Haifa hosts an annual gay pride parade where attendance increases each year. Our last stop before arriving in Tel Aviv was in the village of Jisr-al-Zarqa, a small fisherman’s village located on Israel’s northern coast. The only remaining Arab town in Israel on the Mediterranean Sea, it is located just north of Caesarea and just south of the Taninim Nature Preserve. Jisr Az-Zarqa means “bridge over the blue” [stream]. In Jisr an Israeli Jewish woman working in partnership with a local Arab entrepreneur that created the guest house that is invigorating the economy and has helped create a tourist industry in this tiny Arab village that is a throwback to the middle of the 20th Century. This is another example of Arab Jewish cooperation and why Jisr was added to our itinerary. The guest house is the focal point for building the tourist industry in this town. And, since I’ve never encountered bakery that I could bypass without first tasting something, I wandered to a local bakery where I bought two of the most delicious chocolate rugelach that Israel is known for (Marzipan doesn’t hold a candle to this small Arab bakery) and where the prices were half what they were in Jerusalem and Tel Aviv. We hiked out to the fishing port, past a 16th Century Ottoman ruin and viewed the Mediterranean surrounded by ramshackle fisherman building and a smatter of seaside restaurants (November is not the high beach tourist season in Israel) so there were few diners. The view and scene were extraordinary and with some luck this “village that time forgot” will become a significant tourist destination and improve the lives of its residents. And then we ended the trip in Tel Aviv where I hadn’t been for several years. At dinner that evening, we heard from Mickey Gitzin, an out gay member of the Tel Aviv city council and Executive Director of Israel Hofsheet which is a grassroots movement that strives for an Israeli society that practices cultural and religious pluralism, protects civil rights, and upholds the principles of democracy and Zionism as put forth in the Declaration of Independence. He spoke about the challenges facing the LGBT community in Israel and dealings with the Orthodox community and the right wing government. Thursday morning (it was hard to believe we had already been in Israel a week but we did so much it also seemed like we’d been there for several weeks) we met at the Aguda, the umbrella headquarters of Israel LGBT organizations. Our first presentation was by a panel that consisted of a transgender activist, a transgender Israeli soldier and three lesbians who do family counseling. After their presentation we broke up into groups and I was able to spend some quality time with Ofer Ben David Erez, the transgender soldier who spoke of his transition from female to male and what it was like for him to enlist in the military and be accepted as an equal to other males. For me it was a real educational experience. The second group we met with included an Arab gay man who spoke about what it is like to be gay and Arab in Israel. Mohammed Wari is a well-spoken young man who talked about his coming out to his parents and his family and his becoming a gay activist in the Israeli Arab community. Mohammed was a victim of Palestinian terrorism in March, 2016 while jogging in Haifa. In this article he is quoted as saying: “Terror has no color, race, or religion. Terror is an illness that needs to be stopped. Terror has a clear goal: to kill and destroy the world and the coexistence, in which we live.” His life story is really an inspiration and I really enjoyed the time I spent listening to his life experience and his hopes for the future. After lunch we visited Beit D’ror (House of Freedom) which is unique center for gay, lesbian, bi-sexual and transgender adolescents who have been rejected and alienated because of their sexual orientation. It is a temporary shelter providing basic home conditions for nine adolescents (male or female), for a period of no longer than six months. Besides offering a safe home, a warm bed and meals, it also provides psychological and moral/social support, direction in finding future longer-term solutions, as well as enrichment and educational activities. Crisis intervention and counseling are provided in a safe and welcoming environment by a professional, approachable and supportive team. After our visit to Beit D’ror some of us went on a walking tour of Jaffa and that evening we met with leaders of the Tel Aviv LGBT community at a rooftop reception. Our last day included a visit to the Rabin Center which is the national institute established by the Knesset in 1997 that advances the legacy of the late Israeli Prime Minister Yitzhak Rabin, a path-breaking, visionary leader whose life was cut short in a devastating assassination. The Center presents Yitzhak Rabin’s remarkable life and tragic death, pivotal elements of the history of Israel, whose impact must not be ignored or forgotten lest risk the recurrence of such shattering events. The Center’s mission is to ensure that the vital lessons from this story are actively remembered and used to shape an Israeli society and leadership dedicated to open dialogue, democratic value, Zionism s and social cohesion. The Center promotes activities and programs that inspire cultured, engaged and civil exchanges among the different sectors that make up the complex mosaic of Israeli society. The building is extraordinary with sweeping views of Tel Aviv and movingly tells the story of the life of Yitzhak Rabin through dioramas and photos embedded in the floor that show life around the world at during important times in Rabin’s life. While we only spent one hour touring the museum, on one’s own one could easily spend twice that amount of time learning about Rabin and his world. We had free time Friday afternoon to visit the Carmel Market or just relax before the evening Shabbat program. I decided to go to the Carmel Market which was a real treat because it was incredibly busy with everyone getting ready for Shabbat. That evening we met with members of the Israeli Orthodox LGBT community including Zehorit Sorek and Daniel Jonas, leaders of Bat Kol and Havruta, Israeli Religious LGBTQ Organizations. The dinner was followed by a moving and meaningful visit to the Rabin Memorial at Rabin Square. It was my last official event with the Wider Bridge group as I had an early morning flight to Los Angeles on Saturday morning. I said my farewells to the group at Rabin Square and told them that this was the second most significant trip of my many trips to Israel – the most significant being my trip to Israel in September, 2000 with my husband, Lowell Gallagher, on his first trip to Israel. On the Wider Bridge trip, seeing Israel through the eyes of non-Jewish and first-timer LGBT leaders had a lasting impact on me. Hearing the comments throughout the trip from my traveling companions, especially those who are not Jewish, and their marveling at what an amazing and vibrant country Israel is and more fully understanding the sobering reality that both Israelis and Palestinians live in gave me a new perspective on how I view and understand Israeli society, the Israeli LGBT community, and the relationship between Israelis and Palestinians. As one of the newest members of the Board of A Wider Bridge I look forward to meaningful and rewarding participation in the work of this terrific organization.